Was lovely little Caroline of Edinburg town. So without delay go beg your way to Edinburg town. And some did say what made you stray from Edinburg town? And that’s what became of Caroline of Edinburg town. 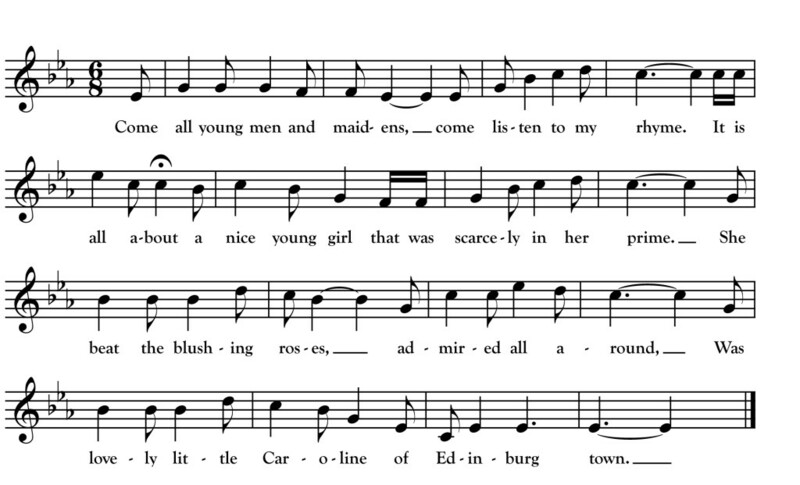 This version of the well-travelled traditional song “Caroline of Edinburgh Town” was sung by Minnesota singer Michael C. Dean and printed in Dean’s 1922 songster The Flying Cloud. Franz Rickaby transcribed the above melody from Dean’s singing in 1923 at Dean’s home in Virginia, Minnesota. Dean told Rickaby that his Irish immigrant mother Mary McMahon Dean used to sing the grim (but beautiful) song to him as a lullaby. This song was one of fifteen transcriptions Rickaby made from Dean’s singing that didn’t get published in Rickaby’s Ballads and Songs of the Shanty-Boy. I was able to access it via copies of Rickaby’s song notebooks held by the Mills Music Library at the University of Wisconsin in Madison. Unfortunately, unlike other songs of Dean’s, “Caroline” was not recorded when Robert Winslow Gordon made a series of wax cylinders of Dean’s singing in 1924 so we don’t know if his misspelling of “Edinburgh” was any indication of his pronunciation of the name of Scotland’s capital city. I learned Dean’s melody and text in 2008 and sang it for the Minnesota Heritage Songbook project – a collection of old songs once sung in Minnesota. That recording (along with the full songbook) is available online at http://mnheritagesongbook.net. My wife Norah Rendell sings this version as well and she even arranged it and recorded it with her band The Outside Track for their album “Curious Things Given Wings.” Much to my delight, Norah has also taught this Minnesota-sourced song to students at the Center for Irish Music.